Image of the host galaxy of the X-ray source 1RXS J101015.9−311909, from the 2MASS sky survey (Jarrett et al. 2000). Active galactic nuclei (AGN) with high X-ray and radio emission represent promising candidates to search for very high energy gamma ray signatures, as pointed out by Costamante and Ghisellini (2002) in their paper "TeV candidate BL Lac objects". The object 1RXS J101015.9−311909 is one of the 18,811 sources in the ROSAT All-Sky Survey Bright Source Catalogue (Voges et al., 1999), coincident with one of the about 2 million radio sources of the NRAO VLA Sky Survey (NVSS) (Condon et al., 1998): Bauer et al. (2000) cross-identified the ROSAT catalog and the NRAO VLA survey to construct a sample of the brightest X-ray sources that are also radio sources, resulting in a sample of 1557 objects. In the multi-frequency "Sedentary Survey" sample of Giommi et al. (2005), 1RXS J101015.9−311909 - with a redshift z=0.14 - is listed as one of the objects distinguished by their extremely high X-ray to radio flux ratio, making it a very interesting candidate for gamma-ray observations. H.E.S.S. observations were carried out between 2006 and 2010, accumulating 64 hours of exposure. In this sample, indeed 263 excess gamma rays were detected, corresponding to about 7 sigma significance (Fig. 1). At the scale of the H.E.S.S. 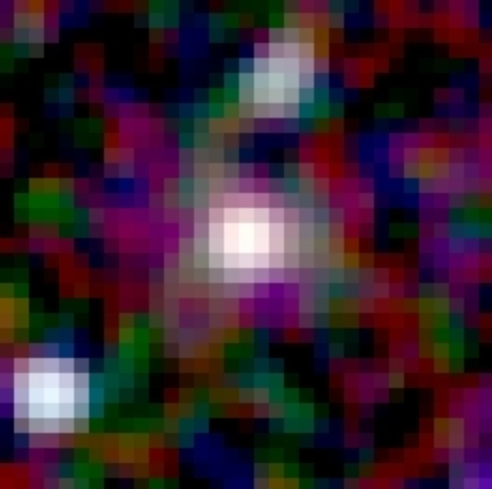 angular resolution of about 6', the source is point-like (Fig. 2), as expected for a distant active galaxy, and the location of the H.E.S.S. source is centered on the radio position of 1RXS J101015.9−311909. No significant variability is seen over the years. 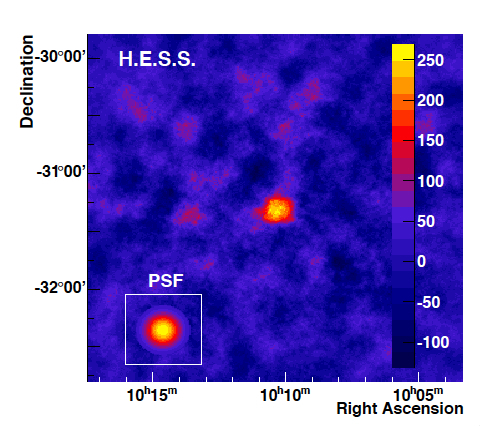 The object is also listed in the GeV gamma ray Fermi Large Area Telescope Second Source Catalog. Fig. 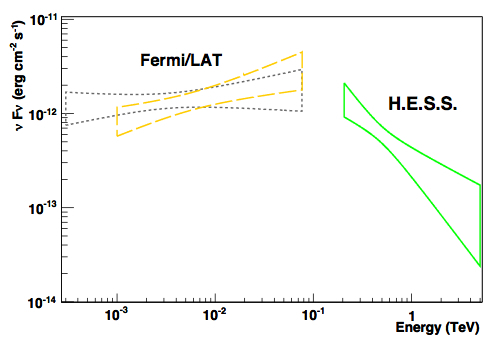 3 shows the spectral energy distribution of gamma rays, with clear break in the spectrum between the Fermi and H.E.S.S. energy ranges. A second spectral peak occurs between optical and X-ray energies; the emission spectrum hence follows the pattern expected for beamed emission by a `blob' of electrons accelerated in the jet emerging from the active galactic nucleus, with synchrotron radiation dominating in the X-ray domain, and very high energy gamma rays being created when these synchrotron quanta are again scattered off electrons. Fig. 1: H.E.S.S. gamma-ray image of 1RXS J101015.9−311909. 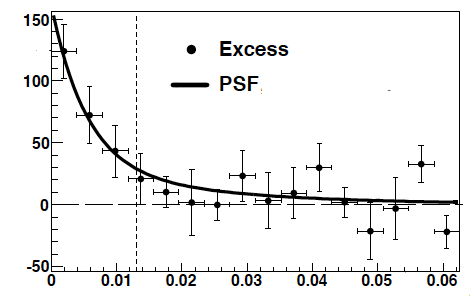 The inset shows the response of the instrument to a point source (PSF). Preliminary. Fig. 2: Gamma-ray excess as a function of the squared angular distance to 1RXS J101015.9−311909, after background subtraction. The full line illustrates the expected distribution for a point source. Preliminary. Fig. 3: Energy spectrum of gamma rays from 1RXS J101015.9−311909, in the GeV (Fermi) and TeV (H.E.S.S.) domains. Preliminary.